How do you spell [kʰəˈnɛfli]? My mom and her mother will, from time to time, make a type of egg noodle or dumpling—these are kind of in the middle of the two, which you use a knife to cut noodle-like portions into a pot of boiling water. We call each individual noodle/dumpling a [kʰəˈnɛfli], and the plural—also the name for the dish itself—is [kʰəˈnɛfliz]. I have never asked my mom or grandmother how to spell [kʰəˈnɛfli], and it only occurred to me the other day while watching a cooking show making a similar dish that I had absolutely no clue how to spell the name of the dish. So what is our mystery food? 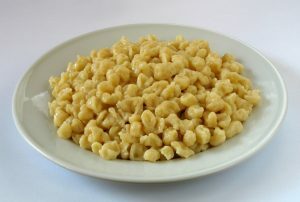 After a bit of digging I found that this is Spätzle, a southern German dish. Spätzle apparently comes in two varieties: Spätzle [ˈʃpɛtslə] (literally ‘little sparrow’), which are noodle-like, and Knöpfle [ˈknøpflə] (literally ‘little button’), which are little balls. 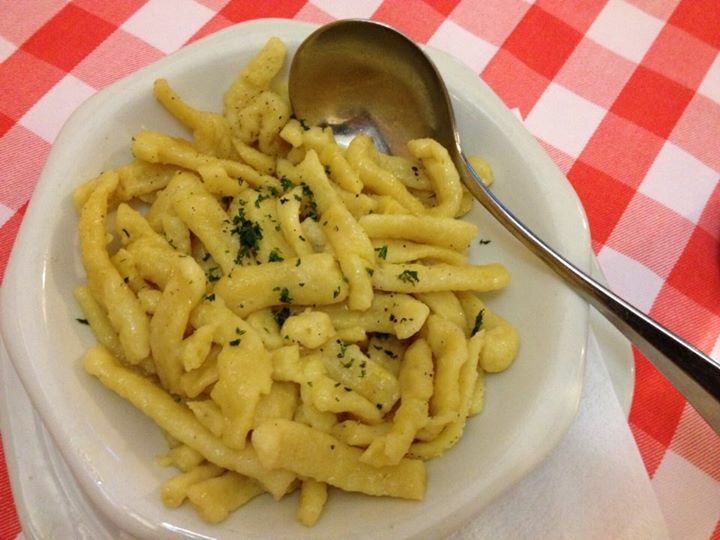 Noodle-like Spätzle, by Qwerty Binary. Used under a CC BY-SA 3.0 license. Ball-like Knöpfle, by Kobako. Used under a CC BY-SA 2.5 license. So there appears to be an interesting, but not at all unexpected bit of phonological (and even morphological) incorporation of an originally German word (Knöpfle) into English. First is the epenthetic schwa inserted to break up the [kn] cluster. This is unlike how English historically handled /kn/, which was at one point a valid consonant cluster in English (as preserved orthographically in words like <knight> or <knell>), where this cluster was reduced to just [n]: so not *[kəˈnai̯t] but [nai̯t]1, and not *[kəˈnɛl] but [nɛl]). Second is the change of the German vowel [ø] into an English vowel. In my English, I’ve noticed two ways in which this vowel is accommodated into English phonology. The first is found here, with [ø] being loaned in as English [ɛ], relatively close to the height and backness of its German counterpart. The second is found in the name Schrödinger, with [ø] being loaned in as English [ou̯], relatively close to its orthographic equivalent. Finally, in terms of loan phonology, is the reduction of the [pf] cluster. Again, this is not at all unexpected in English, where [pf] is only a valid consonant cluster across syllable boundaries. More interesting to me is the semantic change here: a bit of synecdoche where the name of the variant becomes the name of the name of the dish proper—that is, the term Knöpfle replacing the term Spätzle to describe the dish. Unfortunately, without more data, I can’t determine when this happened. Is it unique to my family? I wonder what the Pennsylvania Dutch call the dish? My mother’s side of the family is from Upstate New York, and is Dutch rather than German. I wonder if there is some regional variation there? 1. Unless you’re French, in which case it’s [kəˈnɪɡət].